Protect Our Freedom to Prosper: Caucus & Sign-Up for Convention Delegate! Unable to Attend? Sign-Up/Run for Delegate! 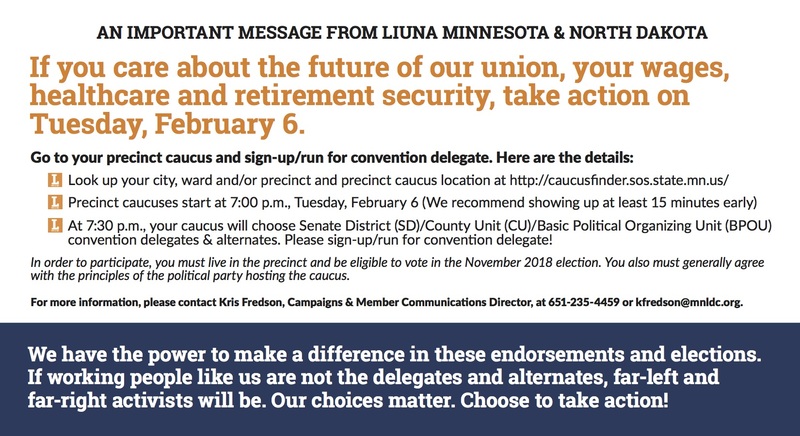 If you want to sign-up/run for delegate to your Democratic-Farmer-Labor (DFL) Party Senate District/County Unit convention, but cannot attend your precinct caucus in-person, you can fill out a Non-Attendee Form and have someone else bring it on caucus night, or send your completed form (or an email with all of this information) to the Chair of your local DFL Senate District/County Unit. If you want to sign-up/run for delegate to your Republican Party Basic Political Organizing Unit convention, but cannot attend your precinct caucus in-person, you need to find someone to sign you up. Shape Your Party's Platform and Introduce a Resolution! If you are interested in shaping your Party's platform, introduce a Resolution! Party platforms embody the principles of the Party. We need the DFL and Republican Parties to share our values and priorities and to protect our freedom to prosper. Fill out a DFL Party Resolution Form or bring your resolution to your Republican caucus on Tuesday. Here are links to Minnesota AFL-CIO Sample Resolutions and Minneapolis Building & Construction Trades Sample Resolutions. If you are interested in serving on a pre-convention committee, such as Rules, Resolutions/Platform, Registration, Nomination, Credentials and/or Overall convention committee(s), please sign-up at your precinct caucus. For more information, please visit the Minnesota Secretary of State website, DFL Party website, Republican Party website, or contact Kris Fredson, Campaigns & Member Communications Director, at 651-235-4459 or [email protected]. We have the power to make a difference in these endorsements and elections. If working people like us are not the delegates and alternates, far-left and far-right activists will be. Our choices matter. Choose to take action!